Note: I listed some of the more common options. There are many other to choose from and there are a variety of options within each particular family. 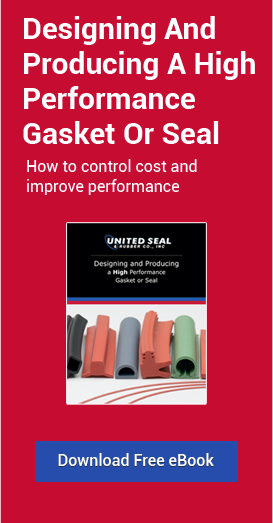 "E" is for environment... Gaskets and Seals can be exposed to all types of environments. The environment may include exposure to sunlight for example. In this type of environment, EPDM is a good choice. However, you would want to avoid the use of Nitrile in direct sunlight. In an extremely high temperature environment of 500 degrees F, you are limited to your choices. Perfluoelastomer materials can be a possible choice but you wouldn't dare consider an EPDM for this environment. "M" is for Media... A very important part of the equation when selecting a compound is the media that will come in contact with the gasket or seal. Nitrile will work very well with oils. However, one would want to avoid natural rubber with oils. EPDM can be a good choice with steam that is below 400 degrees F. When steam is known to get above 400 degrees F, a perfluoroelastomer or a non-asbestos type gasketing material has to come into play. This example demostrates the relationships of TEMP that need to be considered when selecting the appropriate material. "P" is for pressure... Pressure need to be considered as well. First consideration is hardness (durometer), as it may be required to resist extrusion in dynamic designs or where there is a large gap between the matting parts in a static application. Second, is the at-rest vs. operating conditions which would suggest due consideration is given to the long-term compression set properties of a given material. The hardness and compression set properties will vary among the elastomers and within the family of each one as well. While this blog doesn't touch on 100% of the factors to consider, I hope the introduction of TEMP will help you with your selection. The tough part of the selection process is you may have tradeoffs with your selections. Sometimes finding the perfect seal isn't going to happen. Finding the best possible sealing material is the key. Keep in mind that there will be variations in performance within each family of rubber materials. This is especially true with our manufacturing partner, Parker Engineered Materials Group. Parker has a vast catalog of material offerings and by utilizing their own recipes, they can tweak the compound so that it performs a little different than the general purpose version of that material (i.e. slightly greater high temp properties). And more... If you don't see your requirment listed, please ask us! Remember, start with TEMP when you are selecting the proper material for your application.